This tour starts in Saint Petersburg, Russia, at 1:00PM on Tuesday, August 6, 2019 and ends after breakfast on August 10, 2019 in Saint Petersburg, Russia. Your flight should arrive no later than 11:00AM on August 6, 2019. 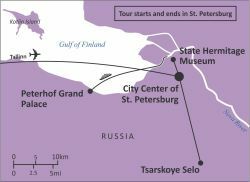 If you are combining this tour with the Baltic Renaissance tour, your connecting flight from Tallinn will be arranged for you and you will arrive in Saint Petersburg in the evening of August 5, 2019. Upon your arrival at the Polkovo International Airport, you'll be met by a driver for your private transfer to our luxury hotel in the heart of Saint Petersburg, in front of St. Isaac's Cathedral. If you are combining this tour with the Baltic Renaissance tour, you will have arrived the night before and the morning will be free to relax at the hotel or explore the city according to your own interests. 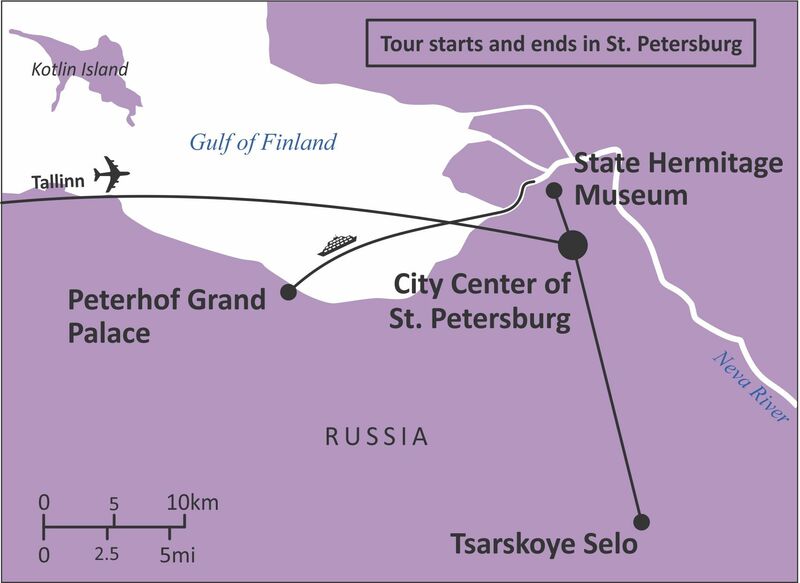 In the early afternoon, we'll begin our tour of Saint Petersburg by boat, taking a leisurely, privately guided canal cruise down the Neva River, then down the Tanka, Moika and Fontanka Rivers. The city is built over 42 islands, and a large network of rivers and canals divides Saint Petersburg into distinct neighborhoods, making for a unique experience when viewing the magnificent classical architecture from the waters. Afterwards, we'll continue with a guided tour of the city's highlights, including Saint Isaac's Cathedral, the Bronze Horseman statue of the city's founder Peter the Great, the Admiralty Embankment, the Winter Palace Garden, followed by a relaxed stroll along the Nevsky Prospect and Small Garden Street to the Church of the Savior on the Spilled Blood. In the evening, we'll share our first impressions of Saint Petersburg during the welcome dinner at one of the city's modern gourmet restaurants. Today, we'll experience more of Russia's imperial wonders as we set out to visit the opulent Peterhof Palace, one of the many royal “summer” palaces built by the Romanovs during the last two centuries of their rule. In the morning, we'll take a hydrofoil down the Neva River and across the Gulf of Finland to the expanse of palaces and gardens that make up the "Russian Versailles". Our guide will take us through Peterhof's Grand Royal Palace and the Upper and Lower Gardens, which are designed in Petrine baroque style and incorporate French themes in their elaborate fountains with gold statues and 142 jets, including the impressive fountains of the Grand Cascade, modeled after a piece commissioned for Louis XIV. After the tour, we'll be able to relax over a refreshing lunch in the palace gardens. After coming back to the city and some time to catch our breath, we'll set out for another adventure: an exclusive backstage tour of the celebrated Mariinsky Theatre, home to such dancers as Pavlova, Nureyev and Barishnikov. Afterwards, we'll attend a Russian ballet performance, certain to become a treasured cultural highlight of the tour. In the morning, we'll visit the glittering Fabergé Museum, located in Shuvalov's Palace and housing the world's largest collection of works by the House of Fabergé. We'll tour the museum and admire these masterpieces of jewelry crafting, the most prized of which is arguably the nine Imperial Easter Eggs created by Fabergé for the last two Russian emperors. After a light lunch, we'll return to the hotel and have some time to rest, before meeting again in the afternoon to continue our cultural journey with a visit to the Hermitage Museum, the second-largest museum in the world boasting a collection of over three million items, from prehistoric artifacts to 20th century German Romantic art. The main museum complex is spread over five buildings, and we'll tour the exhibitions at our own pace. We'll return to the hotel in the evening, and the rest of the day will be free, possibly to take advantage of Saint Petersburg's "White Nights", with plenty of daylight left as the sun stays up through most of the night. This morning, we'll continue our journey through Saint Petersburg's rich history and visual splendor, as we travel to the former imperial town of Tsarskoe Selo to tour the extravagant Catherine Palace and Park. Built for Empress Elizabeth by Bartolomeo Rastrelli, the architect of the Winter Palace, the Rococo blue-white-and-gold summer residence of Russian Tsars is renowned for the extraordinary Amber Room and the Golden Enfilade of state rooms, from the imposing State Staircase to the truly amazing Hall of Light. After the tour of the imperial summer residence, we'll take a guided walk through the Palace Park which combines elements of French, Italian, and English gardens. The English Park is centered around the Great Pond and incorporates a range of lovely structures including Dutch-style boathouses, the Baroque Grotto, and the Marble Bridge; the Italian Park is characterized by picturesque buildings with the Chinese Pavilion, Turkish Bathhouse and the Granite Terrace adorned with large classical statues. We'll have lunch at a pleasant cafe on the Great Pond, and after returning to Saint Petersburg, we'll enjoy some free time, before meeting in the evening to share our favorite discoveries of Saint Petersburg and celebrate new friendships with an elegant farewell dinner at a restaurant offering an incomparable view of the city's skyline. Depending on your flight's departure time, you may have more time in the morning to enjoy the magic of Saint Petersburg, before your private airport transfer which will be scheduled in accordance with your flight's departure time. This tour ends on Saturday, August 10, 2019 at the Pulkovo International Airport in Saint Petersburg. Itinerary specifics subject to change. We welcome your phone calls and email inquiries. Our office is open Monday through Friday, 8:30 – 5:00 EST. Why travel with other women? Many women do not have families or compatible friends who wish to travel. When going on a main-stream tour, women often find that most activities are geared towards couples and quite often they feel left out. Singles' tours are not always what women are looking for. If you do not have a traveling companion, there is also the issue of the expensive "single supplement", sometimes as much as 50 or even 100 percent of the tour cost. By going on women-only tours, women can easily avoid paying for the single supplement by sharing a room with another woman traveler.